Giorgi Cherkezishvili, the Deputy Minister of Economy and Sustainable Development of Georgia, attended the opening of a new restaurant Degusto, which was established upon the investments implemented by the Gazelle Finance. The CEO of the Gazelle Finance Jeffrey Liebert, Dutch Ambassador Johannes Douma, the US Ambassador Jan Kelly, Head of the Partnership Fund David Saganelidze and representatives of other agencies also attended the ceremony. “This is the first project of Gazelle Finance in Georgia, where 100 people will be employed. Financing equals to 700 thousand USD. When we talk about the access to the finances and the capital market development, the role of such funds and their existence in Georgia is very important, and this contributes to the development of the SMEs. The Ministry of Economy welcomes this project and we are delighted that the state-owned Partnership Fund is involved in this project,” – Giorgi Cherkezishvili told the media representatives. Gazelle Finance is an investment management company that owns private representations in the Eurasian region. The establishment of the Gazelle Foundation by the Gazelle Finance in the region increases its potential and provides simplified access to the investments for small and medium entrepreneurs with needs of capital. Gazelle Finance made its first investment in Georgia in a local, fast casual restaurant chain in Tbilisi called Degusto. 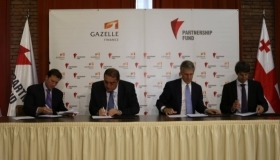 The Partnership Fund will partner with Gazelle Finance, a US fund manager, to invest in Gazelle Fund, which is an investment fund.